Wassup Playmakers, here are some totally mindblowing remixes that'll set the night on fire, believe! Some people don't need no introduction. But for those of you who are not familiar with work of the rocking indie synthpop wizkid The Diamond Cut... well then... Let's go! Currently based in New York City and also working close with the London based pop sensation Visitor, the Diamond Cut just always impresses whenever he releases another remix. Last year he gave us already top notch epic sounding remixes, most notable was the one he did for Fear of Tigers' The Adventures of Pippi Longstrump' which turned a already beautiful song into sheer magic. So in the last last year or so, the Diamond Cut truely became one of our favorite producers/remixers in clubland and is without a doubt at the top of his game, totally up there with that new class of Grum, Starsmiff and Russ Chimes. But what makes him stand out from a crowd? It's that extra magical signature-touch of totally rocking drums and grooving basslines that sound like a comet in the nightsky, ready to floor you and bring instant funk to the sometimes dead and stale dancefloors. Here's a selection of brand new remixes he did for Starrset, Radio INK, Beta. Then we've also included his amazing remix of Booty Luv, one of the favorite Diamond Cut remixes from last year and as bonus we added the 'slowjam' version of Candle Thieves' We're All Gonna Die. Time to get our funk on here at Playmaker. The wonderful Vim Cortez from Paris has just sent us his “SynthFunkatero” EP, a reinterpretation of the funkiest vibes of the eighties through Vim Cortez's musical lens. Vim Cortez pays tribute to the sounds that marked his childhood – from Michael Jackson to Shalamar, from Prince to Cameo. Big synth bass sounds rub shoulders with old school drum machine hits, fresh synth stabs and hot guitar licks. But this is no nostalgic or tongue-in-cheek wink at the kitsch-loving crowd: there is an urgent, darker edge to the beats, the lyrics and the vocals to remind us that synthfunk is the angry, fidgety little brother of future soul. If you like these funky styles, say hello to Vim and support his music by downloading his SynthFunkatero EP on iTunes. Great stuff! The Aminova EP is out since a few days! 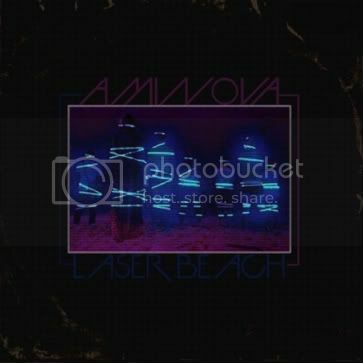 Check it out, we posted about Aminova a few posts ago, none the less, we are happy to present and promote his debut EP, and it's free for download. Awesome! A new mix, Playmakers! Here is 'Legacy of a Skitzo Dancer' by none other than Skitzo Disko mastermind The Metatron. This time he managed to throw in 30 tracks. Check the line-up, enjoy and keep the legacy alive! 15 ElectroSound - Harder, Harder, HARDER, HARDER! And so another living legend dies... If you haven't heard the news yet, fashion icon and visionary Alexander McQueen has killed himself. This is very shocking news, right when London Fashion week is about to take off. McQueen, known for his unconventional designs and shock tactics, earned the British Designer of the Year award four times which makes him one of the most highly regarded names in the fashion industry. Our Italian friend, the wonderful Monsieur Adi, has dedicated one of his upcoming tracks of his much anticipated debut album We Are The Romans, to McQueen. It is a sad yet totally beautiful song and serves the purpose right, a deeply emotional track and shows a different face of Adi's style. His trademark style of classical strings is omnipresent and send shivers down our spine. It's a sort of meditating, spiritual moment as it seems this one seems to be all about stopping the time, standing still for a moment, and moaring about the death of someone who was a true innovator, a talented enigma with the attitude of a true gentleman. Alexander McQueen, you were one of THE GREATEST and will be truely missed. Be supportive! You can download this EP for only 1$. Or why not show your support with a original Ghost Driver T-Shirt!? Visit the Ghost Driver for more info and great graphics. OK, it's time to bring on a super team from France, consisting of Telemac, Hosta and Chwingman, who collaborate under the name Midnight Club. They will release their EP on On The Fruit records. This is awesomely produced retro electro with a touch house and soundtrack, dreamy yet consisted, sounding in vein of likeminded producers such as The Outrunners, Illapa, or maybe even Knightlife at times. Check out a few tunes we have selected for you to enjoy, allongside a Worship remix! 3 Amazing jams, and check the full EP if you're diggin what you hear. Playmaker News, found on the internet! Hello all, here are few new musical pieces for yall to enjoy! All different yet totally amazing music in it's own right.